If a mixed-breed rabbit looks like a purebred rabbit, can it be considered purebred, or is it still a mixed-breed? She had discovered photos of the English Spot rabbit breed which looked to her untrained eye as being exactly like her mixed breed rabbit, and she was excited enough about this to take the time to post on Raising-Rabbits. From the title of her post, it is easy to think she might have believed her rabbit was actually an English Spot rabbit. This of course does not turn her mixed breed rabbit into a purebred rabbit by any means. Similarity in looks does not equate to purebred genetics. There is more clarification at the original page, at which others, including myself, commented. Our e-book, Domestic Rabbit Breeds, provides information and tons of photos of American rabbit breeds even some international breeds of rabbits. 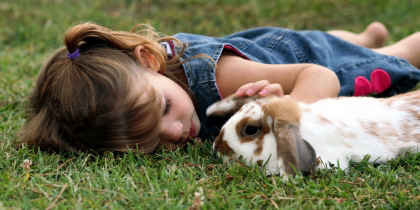 Rabbit genetics is a very specialized field of interest to rabbit breeders and a few pet rabbit owners. This includes issues of coat color and patterns, eye colors, issues of health, even teeth malocclusion. If the owner of the mixed breed rabbit mentioned above had had even a little awareness of rabbit genetics, she might have better understood the nature of her own very cute bunny. Does the topic of genetics interest you, or not? Raising-Rabbits DOES offer a very good description of the basics of rabbit genetics at this link. But, do you need more? Would it be something that would help you with the rabbits you currently own? Do you already have a rabbit genetics resource? Is it complete and helpful? What other resources, if any, are you using regarding rabbit genetics? Learning the needs of our visitors will help us determine whether to create an advanced resource on rabbit genetics, and how much priority to give such a project. We created a very short and simple Survey form and placed it on the Raising-Rabbits Survey page. Please do feel free to register your thoughts or wishes via the survey. It is a matter of selecting a few buttons that apply, adding any other info you wish to offer, and then hitting the submit button. We got two rabbits and one turned out to be a boy. We have them in a gigantic shed like thing with dirt floor and a roof but with fence sides. They have dug a tunnel inside and are now breeding. As far as we know there are only 3 babies from two sets of babies. We know it is bad for the mama but if we approach the pen they all go into the hole. We have only seen them when we go out to fill food. How do we catch the male to fix him? Another thing is since this has happened the mother is acting more like a wild rabbit than a pet one and the male will only get within a foot away from us. How do we tame them and their babies so they will be friendlier? This couple purchased a couple rabbits, and then figured they would give them the run of a large outdoor space, not realizing the problems that could ensue. They wanted pet rabbits, but they now have at least 5 feral rabbits. There are many reasons why it is smart to keep rabbits in cages, and the owners of these rabbits are illustrating several of them. And then they have their babies at the end of long dark tunnels. And then all of them are hard to catch, especially when the other end of a tunnel opens up in the neighbor's yard. Without consistent human interaction, their natural instincts tend to surface. They turn feral. In places like Australia, feral rabbits have the capacity to overrun the environment, destroying the ecosystem. This is why it is generally against the law to release non-native species into the wild. In both Australia and in the Western Hemisphere (Canada, USA, South America), domestic rabbits are non-native. The situation is fixable, thankfully. Lure the rabbits, one by one, with food into a cage where you can then shut the door. Or, you can deploy live-traps near the tunnels until all rabbits are caught. With consistent socialization, your rabbits will become tame again. Each rabbit will need its own cage. OR: if you'd like to continue to give the rabbits the run of the shed, then place 1" x 2" rabbit wire over the entire floor. This will eliminate burrowing and contain the rabbits within the space of the shed. The only immediate problem with this plan is the presence of several males living in the same space. Fights may ensue, although if one or more are neutered, this may help ameliorate the fights. Rabbit owners contact us from time to time about their rabbits experiencing severe diarrhea. Some of them get rapidly sicker, and then die. Diarrhea in rabbits can be life-threatening. The problem might be solved quickly with a change in feed, but sometimes, as in the case of Epizootic Rabbit Enteropathy (ERE), the diarrhea, and subsequent deaths, might overwhelm many of the rabbits in the barn. 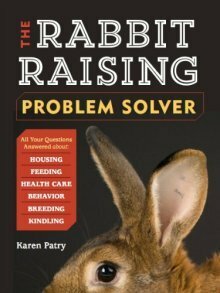 Rabbit Raising Problem Solver has a large section on treating diarrhea, including ERE, in Part 4. I sincerely hope all will be well in your barn. Like this Rabbit Rhythms September 2017 Newsletter? Your friends at Raising-Rabbits.com wish you a wonderful September 2017.